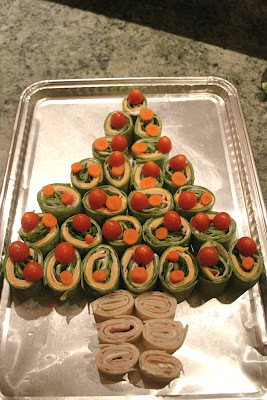 This is a cute, healthy, & easy idea for a Christmas appetizer or snack. We did this for one of my daughters class snack. For the tree part I used spinach tortillas, spread cream cheese on them then added cheese, lettuce, & turkey. Roll em up & cut them in 1 to 1 1/2 inch segments. For the trunk I used a regular tortilla & omitted the lettuce & cheese. Once we had organized the roll-ups in a tree shape we used sliced carrot & little tomatoes cut in half for the "ornaments". You could also use red, yellow, & orange peppers & olives for decoration. I didn't have a yellow pepper, but if I had I would have cut a star shape out & put it on top. This is a great recipe to do with kiddos, & it's tasty!